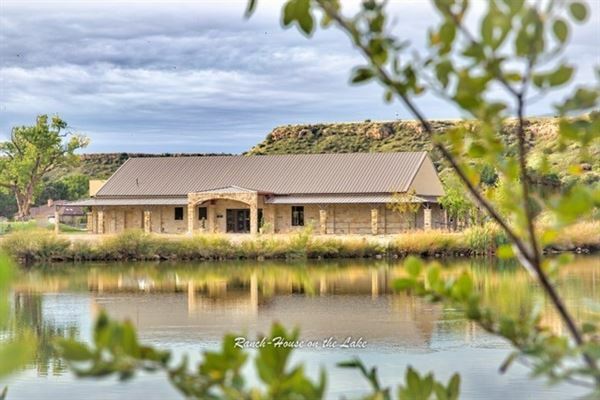 Located 6 miles from Lubbock, the Ransom Canyon Ranch House is set on an island and surrounded by water and canyon mesa walls. The Ranch House has space for 250 of your family and friends to enjoy an outdoor or indoor event. There is no other place like Ransom Canyon in all of west Texas and we hope you will consider hosting your function: wedding, meeting, or reunion with us. Included in the rental of the Ranch House is: -9am-Midnight rental -Set-Up of your event -Tables, chairs, & linens (please inform us 2 weeks before your event of venue set-up and linen needs) -Use of all Ranch House facilities: indoor event center, bridal room, Angel Point (lakeside outdoor area), kitchen (not including the pool area) -Ransom Canyon Police for events that serve alcohol (beer, wine and champagne only. No hard liquor) - You provide catering & decoration. 4,000 square foot cemented area for outside events. Atmosphere/Decor: On the Island, adjacent to the Ranch House facility, surounded by water. Cool breezes to enjoy along with Beautiful sunsets with a backdrop of the Canyon walls. Special Features: Bridal entrance choices & decor can be up to your imagination. Your theme can be "brought to life" in many ways. 70 x 50 event center perfect for weddings, receptions, cultural events, business meetings, corporate events and special celebrations. Special Features: Windows overlooking Lake Ransom on 3 sides. Booked as completly empty for you to use tables and chairs available.